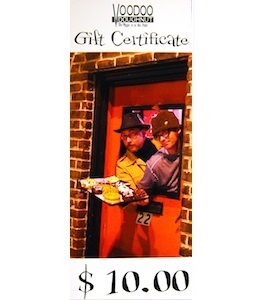 This certificate is good for $5.00 toward your purchase at Voodoo Doughnut. Not to be used with other offers. No cash value. No change can be given, so use it all up at once. Gift Certificates are redeemable at all Voodoo Doughnut locations except Universal CityWalk Hollywood and Universal CityWalk Orlando. Includes $1 for Domestic Shipping & Handling.